Information on Ardentinny taken from the Loch Lomond & Trossachs National Park website. Ardentinny is a small coastal hamlet located on the western side of Loch Long on the beautiful Cowal Peninsula. The deep dark lochs here, with their steep, often mountainous sides, provide dramatic scenery which makes this part of the National Park really special. The beach north of the village is the longest on the Cowal Peninsulaand has been popular with all types of visitors over the years – Viking fleets, Gaelic raiders, wartime Commando assault boats and today’s tourists. With beginnings all the way to the Iron Age (the Dun Daraich Iron Age fort remains are nearby), Ardentinny was established as a ferry crossing across Loch Long to Coulport on the eastern shore and became a hub for travellers from across Argyll. The alternative was a long hike round the top of the loch. By crossing the Argyll sea lochs, the Cowal Peninsula and Argyll became much closer to lowland Scotland. The ferry was based on the Coulport side and could be summoned by lighting a signal fire at Ardentinny. This included the Dukes of Argyll travelling from Inveraray Castle to their second home at Rosneath Castle, and Highland drovers taking herds of cattle to market. People would take the ferry while the cattle would swim the mile across the loch. The ferry is no longer in operation , but evidence still remains. 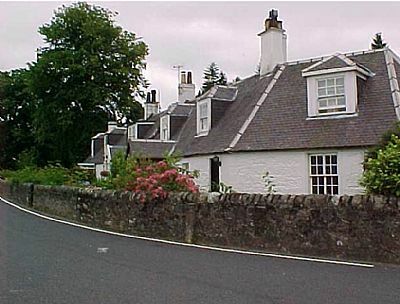 One is Ferry Cottages, built in the early 1800s. A second is the nearby Ardentinny Hotel, parts of which are said to be over 400 years old. At Glen Finart there’s a stone tower, the remains of Glenfinart House. Built in about 1840, it was destroyed by fire in 1968 and demolished, all except the tower. There are a number of walking trails in Ardentinny that will lead you up the shoreline and through the adjacent woods. Explore the stunning woodland on routes once the preserve of Ardentinny’s foresters, who nurtured seedlings here. A walk along an 11km (7 mi) path will lead you to Carrick Castle. Just south of the car park, you can stop off at Glenfinart Walled Garden, a community garden that was formerly the produce garden of Glenfinart House. The National Park has a total of 39 miles of coastline around Loch Long, Loch Goil and the Holy Loch. Their deep basins, shallow sills and sheltered shores make these lochs ideal habitats for wildlife. Ardentinny’s sandy beach is the longest on the Cowal Peninsula and is a great place to enjoy beautiful views of Loch Long. You’ll spot a wide variety of wildlife with an abundance of creatures to be found in the small rock pools and in amongst the exposed seaweed. If you travel around the coast, look out for seals, porpoises and sea birds like guillemots and gannets, or go rock pooling to look for crabs and sea anemones. The village name translates from Gaelic as “hill of fire” or “Beacon Hill”. Access the Community Action Plan to find information on what it is like to live in Ardentinny and the surrounding area, the aspirations and priorities for the future of the local community and how they will be achieved. Visit our camping pages on Loch Long and the surrounding area. The name Ardentinny means the hill of fire deriving either from the ancient rite of lighting fires to the God of Bel on May 1st or more likely for warning fires to aid mariners. The ferry between Ardentinny and Coulport was used by the Dukes of Argyll travelling between Dunoon, Inveraray to Rosneath Castle and in later years by drovers from Argyll travelling to the central markets in Central Scotland. The most infamous use of the ferry was in 1645 when it was likely used when Sir James Lamont and Sir Alexander McDonald raided Argyll lands in Cowal from Rosneath capturing Toward Castle and plundered Kilmun and Strachur. This precipitated the revenge of Argyll the following year when he captured and burnt down Toward Castle, murdering most of its Lamont inhabitants. 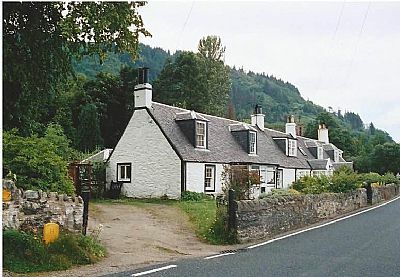 Later years would have been less bloody and the ferry was no longer in existence by the mid 19th century although the old ferry house was where passengers were rowed out to the steamers to Lochgoilhead or Dunoon, there being no direct road to either. The church at Ardentinny (in Gaelic ARD AN-TEINE, “Headland of the Fire”), was built in 1839 for the sum of £500 by a Douglas of Glenfinart in the estate of Glenfinart House (GLEANN A FINEARD, “The glen of the meeting place”). It is of a simple, easy to maintain design and can accommodate about 100 people. Above the entrance porch is a small ‘tower’ with the Church bell that summoned all the estate workers to prayer twice each Sunday and everyone had to be in their place before the Laird arrived! The Laird and his family would have been seated in the two pews at the rear of the Church, each pew with a door to shut out the draughts and to ensure that no-one else occupied the Laird’s seat. In the early days, the community would have been entirely Gaelic speaking. Since then the population of the village has doubled but unfortunately the congregation has declined. The west wall of the Church has the preacher’s sounding board and it was here, beneath this board, that the minister stood behind the communion table. Above the sounding board is the Dove of Peace. To the left of this is the present-day pulpit which is a later addition to the furniture of the church. The font and free standing lectern were gifts to the church from the Woman’s Guild, the font given in 1966 and the lectern in 1988. In 1990 the Woman’s Guild presented the two kneeling stools by the communion table. On the sounding board is a cross dedicated in memory of Margaret Cameron of Glenfinart for her devoted work to the Church. The chair behind the communion table was dedicated in memory of John MacGilp who was the Minister at Ardentinny 1921-1924. The brass bible stand on the communion table was dedicated to the memory of John Alcorn, together with a bible, by his family and friends. The two long-handled collection boxes on either side of the sounding board were in use until the 1930s. As the size of the congregation dwindled they were no longer needed to reach along to the end of each pew and they were replaced with a brass ‘plate’. In the ceiling can be seen the three hooks from which the oil lamps were suspended. They could be lowered on ropes and the tying hooks are still in place on the window frames on the south wall. The pulpit drop depicts the Burning Bush, the emblem of the Church of Scotland. From 1839 to 1874 the church had the services of a “missionary” minister from the Church in Dunoon. On 6th July 1874 the parish had its own minister, Robert Craig. On the 1st June 1932 the Ardentinny Church was united with the Church in Strone to form one ‘charge’ with one Minister who lived in Strone. 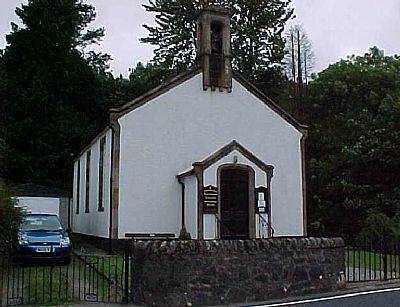 Joined the Free Church in Kilmun in 1843, died 1886. Later Principal of Glasgow University. Later minister of St. Enoch’s Church, Glasgow. Inducted at Strone in 1884. Died 1969 in South Africa. Outside the Church is a row of cottages dating from the mid-eighteenth century. They were originally thatched and had no upstairs windows. The cottage nearest to the Church was the School Room and the Dominie (teacher) lived next door. The new school and school house are now further along the road and was opened in 1893. On the left hand side of the road near the slipway, is the small stone built ferry house. It was from here that travelers summoned the ferry to cross Loch Long to Coulport (“Black Ferry”). It was from here, later, that passengers who wanted to get to Lochgoilhead or Dunoon were rowed out to join the boats on the passenger ferry service that ran between these two towns. This was before there was a road from Ardentinny to Dunoon; there is still no direct road route to Loch Goil. Incidentally, Loch Long was not named because of its length. At 40 miles Loch Fyne is twice as long. Loch Long took its name from the Norse longships that were so much a feature of this area on their cattle and women stealing raids. It was to Ardentinny also that the drovers brought their cattle, having driven them from the Highlands to swim them across the Loch and continue their drive to the cattle markets at Falkirk and Carlisle. Since 1966, Coulport has been developed as a base for the British nuclear powered submarines as part of the Polaris and trident defence systems..
Past the school is the Ardentinny Outdoor Centre (1973 - 1996) where 13 and 14 year olds from districts of Renfrew, Inverclyde and Argyle were introduced to the outdoor life and were taught such skills as mountaineering, orienteering, canoeing, sailing and field studies. Further along the road is the War Memorial and on the left, eight cottages (four at the road side and four under them opening onto the beach), now converted into modern homes. The ferrymen are said to have lived in some of these cottages. 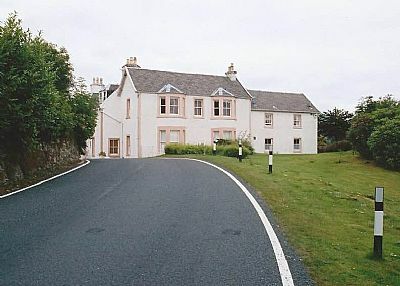 On the right, on a bluff, stands the Mount, originally known as “High Cottage”, which was the dower house of the Douglas’s of Glenfinart House. It was built in the 1700s and it was here that the widow of the Laird moved when the eldest son assumed the title and his wife took over the main house. Over the years it was enlarged and improved and since 1934 when the Douglas Estates were sold off has been a private residence. A reminder of its past connections can be seen in the heart from the Douglas family coat of arms that is reproduced on the floor outside the kitchen. The Ardentinny Hotel stands on a rocky promontory and attracts the yachting and touring fraternity. It is reputed to have been built in the 1700s when there was a ferry service across the Loch to Coulport and this may have been the site where the fire was lit to attract the ferry which was kept at Coulport. Opposite on the corner, was the blacksmith and his smithy became the post office and manual telephone exchange, now converted into modern houses, but maintaining the post office porchway. Right through the village, past the recent development of bungalows, and as the last (or first) house in Ardentinney is the Old Manse. It was built in 1874 for the Reverend Robert Craig and was the Manse until the church was united with the one in Strome on 1st June 1932. As a point of interest, the church parish boundary starts at the burn by Blairmore farm and extends to Whistlefield: the electoral area starts at the burn of Gairletter by Stronhullin Farm. To the north the road runs through the village past the timber houses, imported from Sweden and built by the Forestry Commission to house their staff who worked in the forest nursery that used to occupy the fields behind the houses up to the Loch edge and as far as the grounds of Glenfinart House. The 42 acres produced 7 million forest trees a year and these were used throughout the UK to plant an annual 2500 acres of land. Most of the houses are now privately owned. Past the Swedish houses is the Glenfinart Caravan Park where once stood Glenfinart House. A former Laird, Archibald Douglas of Glenfinart, who died in 1860, is buried in a lonely grave on the wooded hill slope looking out over the Loch. There is a road up to it from the left hand side of the main road before it reaches the Caravan Park. Another Douglas of Glenfinart, General Sir John Douglas CBE, is buried in the imposing Douglas mausoleum in Kilmun churchyard. This mausoleum is built of red stone with a massive door said to be made from a pollard oak tree cut in the grounds of Glenfinart House. On the Douglas coat of arms, carved above the lintel and also on the hillside gravestone, a proud part of Douglas history is recorded. It is the heart surmounted by a crown and three stars signifying the task laid on “the Goode Sir James (Douglas) to carry the heart of Robert the Bruce (1274 - 1329) to the Holy Land for burial. He was unable to carry out this task for on his way he died in Spain in a battle against the Moors and the sacred relic was taken back to Scotland and buried in Melrose Abbey. In 1934 the Douglas estates were sold off and the house became a package holiday base for the Friendship Holiday Association. During the Second World War it was the Officer’s Mess and WRNS Quarters for HMS Armadillo, and after the war it became a hotel. Glenfinart House was destroyed by fire on 24th August 1968 and only the tower remains. Glenfinart House Hotel used to display the Largest Book in the world, first in the hotel, after the fire in a hut in the grounds. Today, the Guinness Book of Records lists another book with that distinction and places it in the USA. Past Glenfinart Caravan Park, at the junction of the road leading down past the village hall to the beach area, is the old mill pond. It is now lost in rhododendron bushes and is empty but it was the ‘head’ for the mill race that powered the wood mill that was situated past the village hall. Today there are a few barns, now being restored and converted that mark the site of the mill and the gas-making plant for Glenfinart House. Glenfinart leads over the hill through Larach Pass (535ft) passing on its way the Glenfinart Hotel and Deer Farm, formerly Barnacabber (Bearn a Cobhair; “Gap of safety”), a recent (1991) venture with a large herd of deer on show to the public. After the Larach Pass, the road drops down to Whistlefield and Loch Eck (Loch Ach or Loch Ech “The Horse Loch”). This glen was the scene of a fight with the Vikings, prior to the Battle of Largs (1263), when King Haco’s fleet of longships anchored in Loch Long and plundered the glen. Ardentinny beach was once the site of a resettlement camp opened in the 1930s to house and retrain unemployed shipyard and heavy industry workers from the Glasgow and Clyde areas. During the Second World War it became a training base for Royal Navy Commandos, HMS Armadillo, and a plaque unveiled on 17th May 1987, now displayed in Ardentinny Church commemorates this. After the war it was taken over by the Forestry Commission to house unemployed people from Glasgow who were retrained in forestry work. Later, families lived in the converted Nissen huts until they were re-housed in the village. There is only one of the original huts left now a Forestry Commission office - and today we drive across the parade ground to a car park and picnic area created by the Forestry Commission on the old huts sites. The whole area that includes Ardentinny was carved out during the mini ice age about 18000 years ago which lasted about 100 years. The ice was ca. 1500 metres thick and much of the moraine was pushed down the glens carving out Glenfinart, Loch Goil, Loch Long, Glen Masan etc. and ended about Gairletter Point. Devensian ice melted about 14000 years ago and the sea level rose considerably as the earth lifted as the weight of the ice lying on it decreased as it melted. The present village was under ca. 40 metres of water and the raised beaches can be seen quite clearly along the hills behind. With weary steps I wander. In a field opposite the Deer Farm Hotel is an Iron Age fort, Dun Daraich (“the fort of the oak tree”) which has some vitrified walls, stone walling and clear evidence of habitation going back several hundred years. It was probably linked to Dunbarton (Alt Cluth - Dun Briton “the fort of the Britons”) when this area was in the Welsh-speaking Kingdom of Strathclyde.